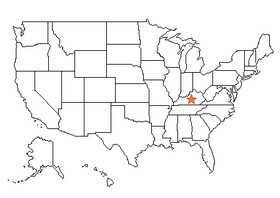 Kentucky has 2 major time zones observed, the east parts are in the Eastern Time Zone, and the west parts are in the Central Time Zone. 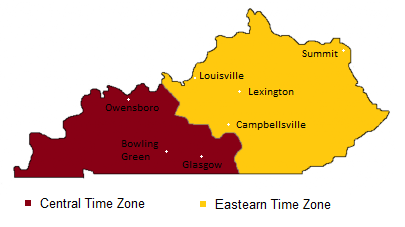 Cities in the Eastern Time Zone include Louisville, Lexington, Summit, Covington, Pikeville, Hazard, London, Danville, Campbellsville, Somerset and Elizabethtown. Cities in the Central Time Zone include Glasgow, Bowling Green, Owensboro, Madisonville, Henderson, Russellville, Hopkinsville, Princeton, Paducah and Murray. Daylight Saving Times are used in Kentucky time zones during summer. Currently the east part observes Eastern Daylight Time, the west part observes Central Daylight Time.